Andrew Heaton runs the medical marijuana dispensary WTJ MMJ Supply in Colorado Springs. He said he believes legal recreational marijuana in the city could deter active duty soldiers from using pot. Recreational marijuana use is now legal in ten states, but it remains off-limits to service members ... and some military communities don't want it to be sold anywhere near bases. Dan Boyce reports that the military's marijuana ban creates tensions in states where pot is legal. As more states legalize recreational marijuana, there's at least one place where the rules haven't changed: the military. Active service members are strictly forbidden to use marijuana, whether it's recreational or medicinal. Standing in a rec center at Fort Carson, Col. is a doorframe-sized poster headlined, "The Costs of Marijuana." Through charts and graphics, it lists the Army's perspective on pot's physical costs, social costs and usage trends. "It emphasizes the fact that marijuana still continues to be the drug of choice in all of our services," said Donna Clouse, prevention services branch chief for the Army's Substance Abuse Program. Her group created the poster, which is displayed at bases around the country. The poster also includes a color-coded map of the U.S., showing where marijuana is legal recreationally or medically. Colorado, the home of Fort Carson, is colored white on the map, reflecting the fact that the state legalized recreational marijuana five years ago. But under the map is a large warning for service members: "Marijuana is still considered a Schedule 1 Drug." "We understand there might be confusion," Clouse said, "especially for individuals who live in the states where marijuana use is legal." For the military, there's no confusion. It is never okay for soldiers to use marijuana, even in a state where it's been legalized for medical or recreational use. Not surprisingly, active duty soldiers are wary of talking about any marijuana use. But as legalization has spread, some veterans are getting increasingly vocal, saying it's time to re-examine the policy. Army veteran Matthew Kahl served two tours in Afghanistan. His second deployment ended after a severe injury to his face, a traumatic brain injury, spinal injuries and post-traumatic stress disorder. It left him taking about 20 different medications. Kahl moved to Colorado to try marijuana as an alternative and said it largely worked. He started reducing his pills, medication by medication, until he stopped taking any of them. He now runs an organization focused in part on securing the right for veterans to use medical cannabis, and he said it's time to be realistic about active duty soldiers and drug use. "I know of people who are deployed, and they often come across hash in Afghanistan," Kahl said, referring to the resin of the cannabis plant that has the same psychoactive effect of marijuana. "They use hash to medicate not just to medicate the horrors, the hardships of war, but to alleviate the boredom," he said. The inconsistencies between state laws and military regulations not only can create confusion for service members. It also has led to tension in some military communities in states where marijuana is legal. Those cities rely on the economic stability that nearby military bases bring, but could bring in hefty tax dollars if they welcome marijuana dispensaries to town. Colorado Springs, Col. is a prime example. Five years after the state's voters legalized recreational marijuana, Colorado Springs remains the largest city in the state that has not yet allowed recreational dispensaries to set up shop. It's likely no coincidence the city is the home of Fort Carson and several other military bases. "The last thing we need to do is make recreational marijuana yet another reason why the Defense Department opts to take missions, troops, personnel … and move it somewhere else," said Colorado Springs City Council member-elect Wayne Williams at a recent candidate debate. 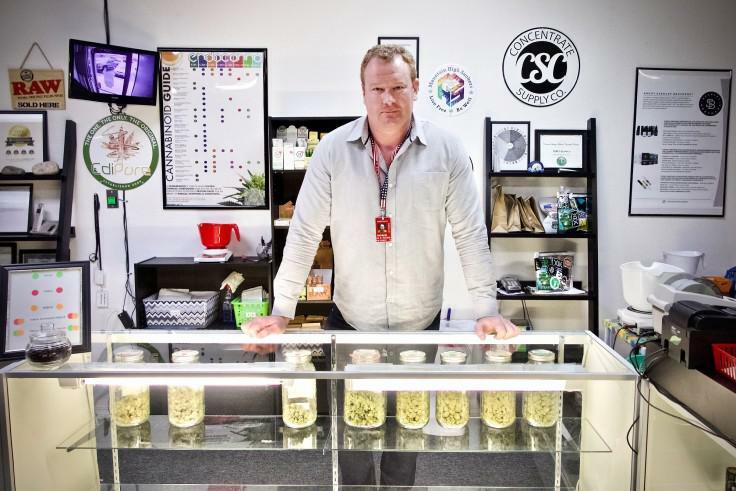 Andrew Heaton runs a medical marijuana dispensary in Colorado Springs, which are legal. He said he's heard that other military towns outside Colorado are trying to use their states' prohibition of marijuana as a reason for the Pentagon to consider locating missions there, rather than at Colorado bases. Heaton disputes that having legal marijuana near a base means more soldiers will use the drug. He argued soldiers can go off-base just about anywhere and buy pot on the black market. "In a community where it's legal, you've got it off the streets for the most part," Heaton said. There are many who would debate that point; just last December, Colorado Springs busted eight businesses accused of illegally selling marijuana. Aside from that, Heaton pointed out military members undergo random drug tests. If a soldier tests positive, it doesn't matter where the marijuana came from. "None of them want to get what they call the BCD, the 'big chicken dinner,' which is a bad conduct discharge," he said. Clouse - the Army substance abuse prevention chief - said as long as marijuana remains illegal federally, it will remain incompatible with both military and civilian services in the Army. Last year, the Department of Defense released a memo specifically reaffirming its prohibition on marijuana - medical or otherwise. Clouse said the Army has not seen any significant uptick in marijuana violations in five years that recreational marijuana has been legal in Colorado.